LONDON — Investigators were searching for a motive Friday behind the killing of a British lawmaker whose death stunned the nation and sparked questions over whether a divisive EU membership debate may have played a role. A U.S. civil-rights group said the man suspected of the attack had ties to an American white supremacist network — adding to speculation that the fatal attack on Jo Cox could have been inspired by her pro-immigration views. Cox — a rising star in the Labour Party known for her social-justice advocacy and calls for Britain to remain in the EU — was shot and stabbed in broad daylight Thursday in her northern England constituency. Campaigning around the fiercely-debated upcoming referendum on Britain's European Union membership was suspended in wake of Cox's death. Batley and Spen MP Jo Cox is seen in Westminster May 12, 2015. Yui Mok/Press Association/Handout via REUTERS ATTENTION EDITORS - FOR EDITORIAL USE ONLY. NOT FOR SALE FOR MARKETING OR ADVERTISING CAMPAIGNS THIS IMAGE HAS BEEN SUPPLIED BY A THIRD PARTY. IT IS DISTRIBUTED EXACTLY AS RECEIVED BY REUTERS AS A SERVICE TO CLIENTS. NO RESALES. NO ARCHIVE. Batley and Spen MP Jo Cox is seen in an undated handout image released on June 16, 2016. British lawmaker Cox was in critical condition after an incident in her constituency in northern England on Thursday, British police said, with media reports suggesting she had been shot and stabbed. Press Association/ Handout via REUTERS ATTENTION EDITORS - FOR EDITORIAL USE ONLY. NOT FOR SALE FOR MARKETING OR ADVERTISING CAMPAIGNS. THIS IMAGE HAS BEEN SUPPLIED BY A THIRD PARTY. IT IS DISTRIBUTED EXACTLY AS RECEIVED BY REUTERS AS A SERVICE TO CLIENTS. NO RESALES. NO ARCHIVE. Police have not suggested a motive for the killing or named the 52-year-old man they have in custody — but local media including NBC's U.K. partner ITV News identified the suspect as Thomas Mair, whose half-brother expressed shock at his arrest. He told ITV that Mair's mother "can't understand" what may have happened. The BBC and Associated Press also have named Mair, citing local sources. The U.S.-based Southern Poverty Law Center said Mair had popped up in its databases and was for decades "a longtime" and "dedicated" supporter of the neo-Nazi National Alliance. It added that Mair had purchased titles including the "Improvised Munitions Handbook" — which gave instructions on how to build a pistol — from the Nazi Alliance's publishing imprint. The National Alliance's late founder was known for racist novels — including a fictional story of a white man fighting in a race war, according to the Southern Poverty Law Center. A man by the name of Thomas Mair from West Yorkshire also named as a former subscriber and supporter of the pro-Apartheid publication SA Patriot, according to the Associated Press. Thursday's attack in West Yorkshire's small community of Birstall came hours after a high-profile lawmaker in the "Leave" campaign unveiled a controversial poster blaming the refugee crisis on the EU and featuring a long line of migrants. "We... have far more in common than that which divides us"
Cox had frequently pleaded for the campaign not to be hijacked by immigration fears, writing in a commentary for her local Yorkshire Post newspaper last week that "immigration is a legitimate concern, but it's not a good reason to leave the EU." While campaigning on the "Brexit" referendum has been suspended, the poll is still due to be held next Thursday. Britain's pound sterling currency recovered in value against the dollar after the tragedy, which analysts said could hurt the momentum of the "Leave" campaign. Immigration fears had boosted the "Leave" campaign in recent days, giving it a poll lead for the first time after months in which the "Remain" camp was comfortably ahead. Alan Ruskin, global co-head of foreign exchange research at Deutsche Bank, said it was clear that people were discussing whether there was a chance Cox's death would influence a Brexit vote in favor of "Remain." "It is a tragic event all around," he said. "There is a sense, there is an immediate emotional reaction, but there is still a week before the referendum itself." Cox's death has deeply shaken Britain, where gun controls are strict and shootings are rare. U.K. Prime Minister David Cameron led tributes to Cox in Birstall on Friday after laying flowers at the scene of the attack. Prime Minister David Cameron and Labour Party leader Jeremy Corbyn lay flowers while Shadow foreign secretary Hilary Benn and Commons Speaker John Bercow look on in Birstall, West Yorkshire, after Labour MP Jo Cox was shot and stabbed to death in the street outside her constituency advice surgery. Flowers left at Parliament Square opposite the Palace of Westminster, central London, following the death of Labour MP Jo Cox, who died after being shot and stabbed in the street outside her constituency advice surgery in Birstall, West Yorkshire. Labour Party leader Jeremy Corbyn (centre) speaks to the media during an impromptu vigil at Parliament Square opposite the Palace of Westminster, central London, following the death of Labour MP Jo Cox, who died after being shot and stabbed in the street outside her constituency advice surgery in Birstall, West Yorkshire. People hug each other during an impromptu vigil at Parliament Square opposite the Palace of Westminster, central London, following the death of Labour MP Jo Cox, who died after being shot and stabbed in the street outside her constituency advice surgery in Birstall, West Yorkshire. A message left by Mary Creagh in Birstall, West Yorkshire, following the death of Labour MP Jo Cox, who died after being shot and stabbed in the street outside her constituency advice surgery in the town. Labour Party leader Jeremy Corbyn and deputy leader Tom Watson (rear) arrive to leave tributes at Parliament Square, opposite the Palace of Westminster in central London, following the death of Labour MP Jo Cox, who died after being shot and stabbed in the street outside her constituency advice surgery in Birstall, West Yorkshire. A woman lays some flowers at Parliament Square opposite the Palace of Westminster, central London, in tribute to Labour MP Jo Cox, who died after being shot and stabbed in the street outside her constituency advice surgery in Birstall, West Yorkshire. People stop to look at tributes left at Parliament Square opposite the Palace of Westminster, central London, in respect to Labour MP Jo Cox, who died after being shot and stabbed in the street outside her constituency advice surgery in Birstall, West Yorkshire. People writing messages of tribute at Parliament Square opposite the Palace of Westminster, central London, in respect of Labour MP Jo Cox, who died after being shot and stabbed in the street outside her constituency advice surgery in Birstall, West Yorkshire. Tribute messages at Parliament Square opposite the Palace of Westminster, central London, in respect of Labour MP Jo Cox, who died after being shot and stabbed in the street outside her constituency advice surgery in Birstall, West Yorkshire. People look at tributes at Parliament Square opposite the Palace of Westminster, central London, in respect of Labour MP Jo Cox, who died after being shot and stabbed in the street outside her constituency advice surgery in Birstall, West Yorkshire. Mary Creagh (left) and Caroline Flint (second right) leave St Peter's Church Birstall, West Yorkshire after a vigil following the death of Labour MP Jo Cox, who died after being shot and stabbed in the street outside her constituency advice surgery in Birstall, West Yorkshire. A general view of a sign for Birstall, West Yorkshire, after Labour MP Jo Cox was shot and stabbed to death in the street outside her constituency advice surgery. Floral tributes are left in Birstall, West Yorkshire, after Labour MP Jo Cox was shot and stabbed to death in the street outside her constituency advice surgery. Yvette Cooper (second left) leaves St Peter's Church Birstall, West Yorkshire after a vigil following the death of Labour MP Jo Cox, who died after being shot and stabbed in the street outside her constituency advice surgery in Birstall, West Yorkshire. The Union flag at half-mast on top of Portcullis House, London, with Queen Elizabeth Tower in the background, after Labour MP Jo Cox was shot and stabbed to death in the street outside her constituency advice surgery in Birstall, West Yorkshire. Labour party general secretary Iain McNicol (right) and John Cryer MP leave floral tributes in Parliament Square, London, after Labour MP Jo Cox was shot and stabbed to death in the street outside her constituency advice surgery in Birstall, West Yorkshire. Reverend Paul Knight, the vicar of Birstall, reads messages of condolence written by Prime Minister David Cameron and Labour Party leader Jeremy Corbyn in a book of remembrance for Jo Cox in St Peter's church in the West Yorkshire town, after the Labour MP was shot and stabbed to death outside her constituency advice surgery. Previously unissued picture dated 21/11/2006 of Jo Cox (red scarf), Andrew Mitchell (centre left) and David Cameron (centre right) during a visit to Darfur in the Sudan as part of the Conservative leader's two day tour of the region. Left to right: Shadow foreign secretary Hilary Benn, Commons Speaker John Bercow, Prime Minister David Cameron, Speaker's chaplain Reverend Rose Hudson-Wilkin and Labour Party leader Jeremy Corbyn arrive to lay flowers in Birstall, West Yorkshire, after Labour MP Jo Cox was shot and stabbed to death in the street outside her constituency advice surgery. Prime Minister David Cameron and Labour Party leader Jeremy Corbyn lay flowers in Birstall, West Yorkshire, after Labour MP Jo Cox was shot and stabbed to death in the street outside her constituency advice surgery. Labour Party leader Jeremy Corbyn speaks to the media after he and other senior politicians laid flowers in Birstall, West Yorkshire, after Labour MP Jo Cox was shot and stabbed to death in the street outside her constituency advice surgery. People lay flowers in Birstall, West Yorkshire, after Labour MP Jo Cox was shot and stabbed to death in the street outside her constituency advice surgery. In a rare display of political unity, Cameron stood side-by-side with opposition leader Jeremy Corbyn to mourn Cox's death. "Today our nation is rightly shocked. And I think it is a moment to stand back and think," Cameron said. "Where we see hatred, where we find division, where we see intolerance, we must drive it out of our politics and out of our public life and out of our communities. Corbyn, meanwhile, called the slaying of Cox was "an attack on democracy." 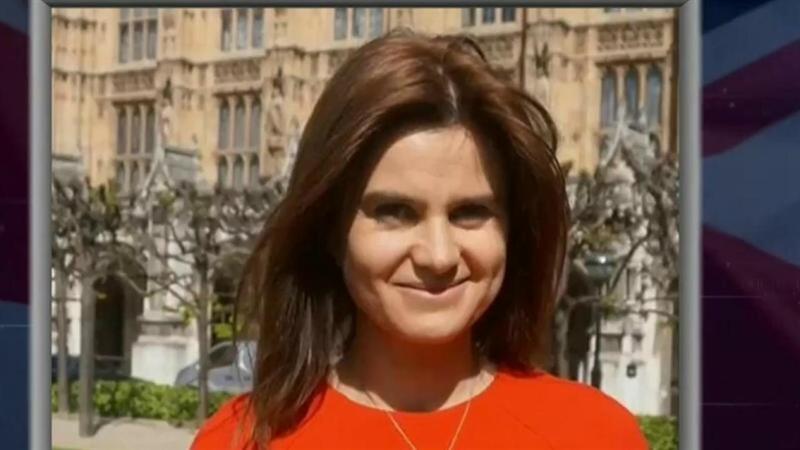 "It's the well of hatred that killed her," he added, saying that Cameron had accepted his request to recall Parliament from a break on Monday so lawmakers can pay tribute to Cox. The attack has also resonated outside of the U.K., prompting outpourings of condolences and solidarity from officials around the world. Presumptive Democratic presidential nominee Hillary Clinton said in a statement that she was "horrified by the assassination" and that Cox was "a rising star." "It is cruel and terrible that her life was cut short by a violent act of political intolerance," she said.